JERSEY BOYS first opened in London at the Prince Edward Theatre on 18 March 2008 and moved to the Piccadilly Theatre in March 2014. The Olivier Award-winning West End production will closed on Sunday 26 March 2017 following nine amazing years in London. The first UK & Ireland Tour of JERSEY BOYS was a record-breaking success and ran for 18 months, from 4 September 2014 to 5 March 2016. Winner of Broadway’s Tony, London’s Olivier and Australia’s Helpmann Awards for Best New Musical, JERSEY BOYS is the winner of 57 major awards worldwide and has been seen by over 24 million people worldwide. 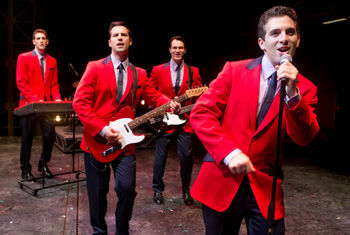 JERSEY BOYS can currently be seen across the United States on its US National Tour. The BROADWAY production closed on 15 January 2017 as the 12th longest running show in Broadway history. JERSEY BOYS is written by Marshall Brickman and Rick Elice, with music by Bob Gaudio and lyrics by Bob Crewe. The National / UK & Ireland Tour production is staged by the entire original Broadway creative team, led by director Des McAnuff and choreographer Sergio Trujillo, with scenic design by Klara Zieglerova, costume design by Jess Goldstein, lighting by Howell Binkley, sound by Steve Canyon Kennedy and projection design by Michael Clark. The orchestrations are by Steve Orich and the music supervision and vocal arrangements by Ron Melrose. The UK & Ireland Tour of JERSEY BOYS is produced by Dodger Theatricals and Ambassador Theatre Group, with Joseph J Grano, Pelican Group, Latitute Link and Rick Steiner.